The river wall on the south side of the Thames between HMS Belfast and Southwark Crown Court has undergone many changes in its history including the demolition of the old pier and raising of the wall height for flood prevention. The wall was constructed from yellow stock bricks that had been protected by render in places, however due to many years of weathering by the tides the exposed areas of masonry had suffered from loss of pointing and failed brickwork. Following a survey of an 85m length of the wall, carried out on behalf of Her Majesty’s Court Service by Peter Brett Associates, we were awarded the contract for carrying out repairs under the direction of EC Harris LLP. The planning for the works had to take into account the effect of the tides and was further complicated by the need to satisfy a number of 3rd parties. These included the Port of London Authority, the Environment Agency, the local authority and the owners of the adjacent areas of land either side of the wall as well as the operations of the Court Service. Scaffolding was progressively erected along the face of wall, founded on the riverbed and mechanically tied to the wall, with all scaffold boards tied down to prevent movement due to tidal action. Defective render was removed by use of electric breakers to expose the old brickwork below. Eroded joints were repointed in a fast setting repointing mortar and missing bricks replaced with bricks that matched the existing. Weed killer was applied to unwanted vegetation. This was followed by preparation of the surfaces by grit blasting to provide a key followed by the application of a spray concrete containing an alkali free accelerator and reinforced with polypropylene fibres. 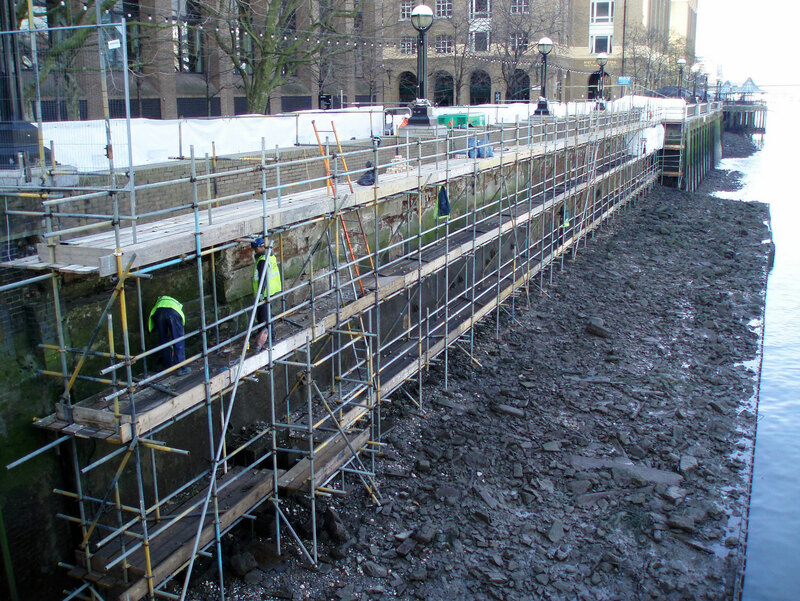 The finish was cut to line and trowelled whilst the excess material was cleaned from the scaffold and riverbed prior to the rising tide covering the work.